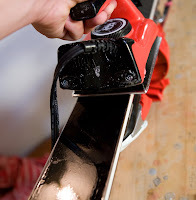 Welcome to Ski Tuning 101! When I started tuning, I had to teach myself everything. I found that shops will usually tell you anything to get you to buy more junk, and most resources tend to be geared toward racing. There are a lot of great tuning resources on the web, but I have not found any that use photos to walk you through the process, start to finish, using basic gear. That’s why I’m here. I’m not a professional tuner or skier, and most of what I’ve learned is through trial and error. So take all of this with a grain of salt, and use it as a starting point for learning to tune. I’ve done all the dirty work for you – from creating tuning kits for all different budgets, to putting together a basic photo guide to tuning at home. So check out the links on the right to the nine different chapters, including the photo guide, and feel free to email me with any comments.